﻿ Add Social to Your Email Marketing to Boost Your Nonprofit Audiences » Red Mango Marketing! That’s good advice when working with nuclear ghost-catching equipment strapped to your back, but it took breaking that rule for the Ghostbusters to defeat the Stay Puft Marshmallow Man. Crossing your social media streams and email marketing so your audience can move easily from one to the other will help grow your nonprofit organization’s reach on both channels. Using Constant Contact’s new email social block, you can start promoting your social channels and build an audience that will spread the word about your nonprofit for you. Building an email list builds an audience for your nonprofit organization, but building a social audience helps to support your email efforts. The more you build up your social channels, the more likely you’ll be able to drive traffic to sign up for your email list, and vice versa. Social and email should work together to grow your organization’s reach and audiences. Adding social links to your email helps potential donors or volunteers find your social platforms, and also helps them share your email with their social network, reaching new people that may also be interested in your cause. Adding social media buttons to your email not only brings your channels closer together, it also gives readers a third option, something other than clicking through to your site or closing the email. Even if they don’t click your call to action button to sign up as a volunteer or donate, they may decide to look at your social media channels, giving you another chance to target them later. When designing your email, place a social media block below your call to action button. You could also add a small banner that says, ‘Spread the Word to your Friends,’ above the social links to provide context and help push them to action. If you’re promoting your fundraising event in an email and the reader decides not to donate or sign up to volunteer, linking your social media channels can help them stay up to date with reminders to get involved later. If your cause needs petition signatures, as another example, it may be better for readers to share your email message on their own social media channels, to build your audience and spread the word faster. Combing your marketing efforts on social media and email will help grow your nonprofit organization’s reach on both channels. With a bigger reach, you’ll have more firepower when promoting a fundraising event, getting signatures for local causes or zapping the Stay Puft Marshmallow Man in the streets of New York City. Try Constant Contact’s new email social block to start connecting social media and email marketing to spread the word about your nonprofit. 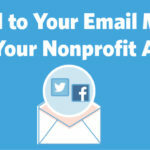 The post Add Social to Your Email Marketing to Boost Your Nonprofit Audiences appeared first on Constant Contact Blogs. This entry was posted on Wednesday, July 11th, 2018 at 8:00 am	and is filed under Email Marketing, News & Updates, Nonprofit. You can follow any responses to this entry through the RSS 2.0 feed. Both comments and pings are currently closed.